I couple of weeks ago I was invited to a Melbourne Cup Charity Event to celebrate the Spring Racing Carnival. It was a lunch on behalf of one of my favourite local charities, the Breast Cancer Foundation of WA. 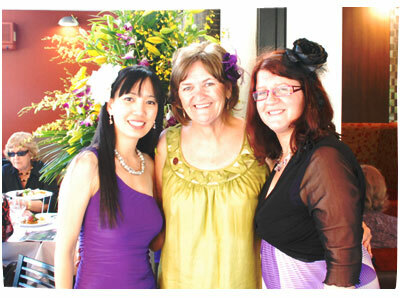 I’m here pictured with the founder of BCFWA, Ros Worthington, and the Marketing Manager of BCFWA, Vanessa Bradshaw. I had such a lovely time! Purple is the signature colour for the BCFWA. It just so happens that I love wearing the colour purple, and in my wardrobe I have 5 purple dresses! I have often been told that purple is the colour people wear when they are feeling sexually frustrated. Another theory I have heard is that purple is the colour that glam rock stars wear as a sign of their status. Well, I am glad to say that I don’t fit into either of those categories. I like purple because I think it is so confident a colour. It stands out like red, but without the “look at me” factor, and it is so womanly in a way that pink is just too girly to be. So purple is the perfect colour to raise awarness of an important cause. I decided to wear with this shoulder dress from Fashion Junkee, because it was more appropriate for a cocktail/day event. It is quite traditional to wear a hat or a head piece with your outfit to the Melbourne Cup – and this year I saw so many amazing designs, some serious, and some frivolous. I believe each year the head pieces are becoming more fashion forward and edgier. It’s very cool to sit and watch all the variations go by. However, for me, spending $150 for a feathery hat that I will only wear once a year, and probably will end up in my children’s craft box, is not my kinda thing. 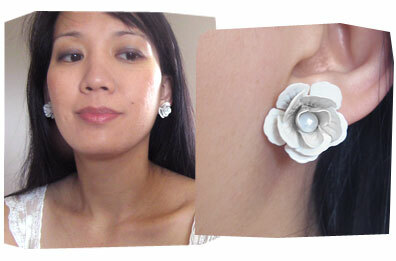 So I just wore a silk flower clip which I could happily wear to a wedding or some other function. Shoes and sequin clutch from Betts, necklace by Kelly McIntyre. I took this photo a couple of weeks ago, when I was 36 weeks pregnant. I know was whinging about having very few clothes to wear at this stage, but I managed to find an old halter top that fit perfectly! I think I bought it years ago, on sale from Jeanswest. I love how the fabric is long and stretchy. And the funky lines hardly make me look pregnant at all! Yay for wearing trippy optical illusions! My jeans are over-the-belly styled maternity jeans from Bump, Baby & Beyond. I have been living in these jeans for a huge part of this pregnancy. I absolutely love them. They are basically pull up jeans. With no fly, buttons, or buckles. You just pull them up, stretching the belly-band over your tummy. It’s funny how I have gotten so used to them, and hopefully when I move back to normal jeans, I won’t forget to do up my buttons and fly! Check out my favourite online shops in my Fashion and Shopping Directory. This year I organised a Christmas Dinner for all the mothers at my son’s Pre-primary school. We’re a big, friendly bunch, and we’re all pretty close. We voted for dinner to be held at a local bar and bistro. I had never been there before, but I trusted everyone else’s opinion. I arrived at the place 15 minutes early. I figured that since I organised the event, I should be there first. But I didn’t know where the correct entrance was, so found myself wondering around the bar – the LOCAL SUBURBAN BAR. The place was COMPLETELY PACKED with blue collar workmen, having all their end of week Christmas drinks, playing pool and watching the football on big screen televisions. And here I was. Pregnant. Wearing a SEMI-SANTA OUTFIT, SPARKLY SILVER HEELS AND HOLDING A BAG FULL OF GOODIES!! I got waaay too many stares. CRAP everyone must think I’m the Christmas performer who gives out presents!! Or the singer!! Or even worse, the stripper!! Make no eye contact. Make no eye contact. I walked very fast from one end of the room to the other. Only to find a locked door, then I walked through the room again. Then around once more. I could have died from embarrassment! ARGH! NO! I’M JUST HERE FOR DINNER! Thank goodness he led me to the correct door to the bistro. After that, I learnt my lesson and left the Santa hat for after dinner. So I’m 6 weeks pregnant. With all the food I’m eating (and the lack of exercise), my tummy and thighs are starting to expand! I’m starting to show a baby bump! Well, when I say “bump” I really mean that weird tummy flab that looks a bit like a “muffin top”. I’m not too worried about the weight gain. I’m actually looking forward to having my body change during the pregnancy. I’m a bit nostalgic about it. It’ll be the last time I’ll ever be pregnant! However I realise that I’m fast running out of clothes to wear. All my jeans are getting a bit tight and I have to wear them low on my hips. I guess I’m at that stage where I should be looking to wear proper maternity clothes. If I keep wearing my usual clothes, I’ll stretch and ruin them all – as I’ve discovered from the past. This is me wearing a $30 scrunch skirt pulled up to be a tube top. Lots of room to grow in the tummy area! These have to be my favourite earrings this season. I’ve been wearing them everywhere! With jeans. With dresses. They are just so cute! Today I went to a cafe to meet up with a friend who recently had a new baby. It was a lovely morning for it – sitting under umbrellas with the warm spring breeze and hot sunshine. 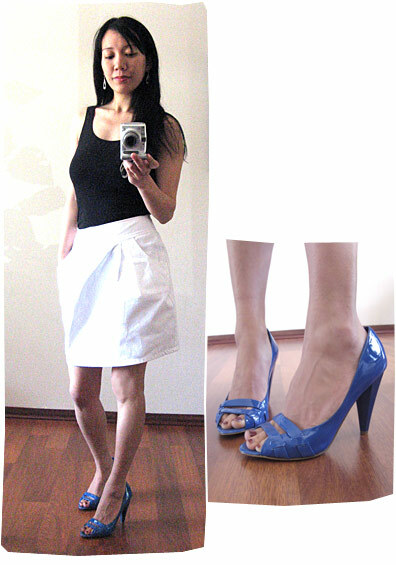 I’ve been eagerly waiting for the weather to warm up so I can finally wear my new white tulip skirt, which I picked up at Soon Lee, in Singapore. I love it! It’s so cute! I’m also wearing black singlet top from Country Road. And shoes from Nine West. Blue shoes make me happy! Ah the days are getting warmer, the flowers are blooming, and my mood is getting more colourful each day! I love this dress! It’s so simple, vibrant and feminine. Especially love the little flower petal skirt layer. And the crazy coloured print. I’ve been looking for more bright coloured clothes for spring and I’m loving the bright pink.